Rm Sitemaps focuses on site sitemaps, XML files that allow search engines to obtain a "map" of links and facilitate bot crawl. Olivier Duffez developed this tool with the aim of offering webmasters a unique tool of its kind, in order to make them autonomous on this point since practically no one in the profession offers this service individually. Like his colleague, the crawl starts once the url of the sitemap is filled in. Different parameters can be adjusted from the first screen, but the coupling with Analytics and Search Console is proposed later. The crawl starts immediately and counting about 1 url/second, a ratio is established after a few moments. 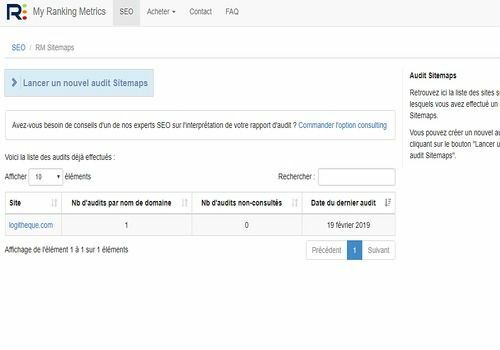 The report/report tells you the status of the page, the number of errors, anomalies and bad configurations, and makes sure that no URL of the sitemap is blocked by the robots.txt. Finally, last but not least, the report will provide a valuable list of orphan pages that penalize your site, as well as all pages that do not appear in the sitemap. These errors or possible problems are obviously to be corrected as quickly as possible, because globally they are the source of poor SEO performance. The tool is not free and can be used with RM Tech credits, but a trial of 100 URLs is available if you want to get an idea. Please note that the attached reports are not downloadable and some parts are not filled in.